Shrubby variety with creamy white blooms and a dense growth habit. Makes an excellent specimen or understory planting. Hardy to -30F (-34.4C); height: 15ft. 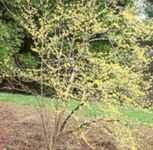 Large shrub or small tree with a spreading habit, produces masses of small yellow flowers in the early spring, before the leaves develop. The flowers are followed by small green edible fruits which mature to red in the autumn. Fall foliage is reddish purple. Hardy to -20F (-28.8C); height: 15ft. Large shrub or small tree with creamy white blooms followed by orange red fruit. Occasionally blooms again in the fall. Upright growth habit. Hardy to -10F (-23.3C); height: 75ft. This Japanese native produces masses of bright red fruits in mid summer and bright yellow blooms in the spring. Very pretty ornamental or specimen tree. Hardy to -30F (-34.4C; height: 26ft. This variety is usually seen as a shrub, though it can be trained into a small tree, and is grown chiefly for its diversity of color. In the spring, it is covered with small white flowers, in fall, the leaves turn a dramatic deep red and in winter, the twigs are a showy red. Hardy to -30F (-34.4C); height: 10ft. Attractive red stems brighten up the winter garden. 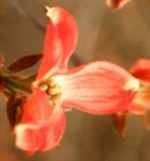 Shrubby species with bright green leaves and white spring blooms. Hardy to -30F (-34.4C); height: 10ft. Early blooming variety with outstanding red blooms. New growth and fall foliage are red as well. Bright red berries. Hardy to -30F (-34.4C); height: 15ft. This beautiful upright dogwood makes a lovely small tree. Large 4in. white blooms literally cover the branches in the spring. Leaves are purple-red on the surface, but the underside is a silvery grey. Hardy to -20F (-28.8C); height: 15ft. ; height: 20ft. Spectacular variegated leaves help to make this variety a hit even when not sporting its blooms. Leaves have a bronze-gold edge . The bark is a light grey, making it an interesting winter attraction as well. Hardy to -20F (-28.8C); height: 15ft. ; height: 15ft. Prolific milky white flowers appear in June of this lovely small tree, followed by red fruit in late summer. Fall foliage is red to scarlet. Eventually, the tree will develop an attractive pattern on the trunk. Hardy to -10F (-23.3C); height: 30ft.